1. Pour 3/4 cup of coffee into each serving mug and stir in 1 package of hot chocolate mix. 2. Drop in 2 Hershey’s Kisses into each cup and stir until melted. 3. 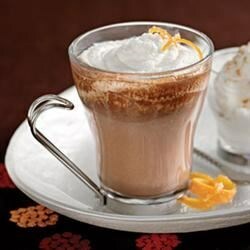 Add dollop of whipped cream and a sprinkle of cocoa powder to each cup.